Do you ever stop by the CMC Gift Shop? I thought you should know a few things about the Auxiliary that runs it, as they make a bigger difference than most of us realize. The Auxiliary is a separate organization and I am the Liaison with them for CMC. 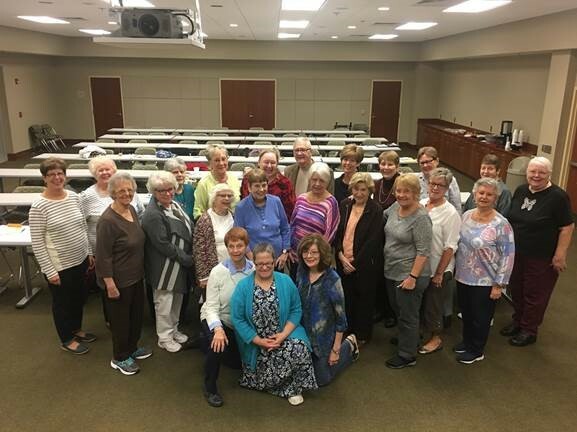 Yesterday, The Auxiliary had their Annual Meeting (Pictured below). Auxiliary members manage and staff the Gift Shop at Conway Medical Center. They have several volunteers that act as purchasing agents, choosing the seasonal and regular items they stock. No one is paid, as they all volunteer their time. In addition to the CMC Gift Shop, the Auxiliary runs fundraising events including Friday Krispy Kreme Donut Sales, Books Are Fun sales, Masquerade Jewelry sales, and more. $12,000 for CMC’s Healthreach program called “Smart Snacks”. Their support feeds a lot of disadvantaged children in and around Conway each weekend of the school year. $9,000 in scholarships for the employees and the children of employees who are studying to go into Healthcare. $6,000 in support of the Kingston Golf Classic, a fundraising event run by the CMC Foundation. Congratulations to these deserving recipients. CMC Foundation has six endowments established to provide scholarships. Learn about each endowment and how you can contribute.